Since La Noche en Blanco (White night) celebration is around the corner in Malaga and it seems to be returning to our Capital Madrid, we thought it would be good to share some information about this unique night. La Noche en Blanco, translated in English White Night, is the cultural celebration which roots are coming from Paris. It was first time celebrated in 2002 and it is also known as Nuit Blanche, White Night in French, or All-Nighter due to its nature. The Nuit Blanche is normally annual all-night arts festival taking place lasting only one night. It offers a variety of artistic events which are free and open to everyone. This for sure allows you to have a truly unforgettable night. It is also a great opportunity for national and international artists to share their works and skills with the public. It gives them an incredible amount of exposure during one single night. A variety of events which takes in different museums, galleries, cultural houses, streets and other areas turns the host city into an open-air museum. Although Celebration last only one night it had such a big success that quickly the festival spread around other European cities. Brussels, Madrid, Paris, Riga, Roma, are only a few cities which started organising its own White Night Celebration. Since 2002 the festival was/is hosted and celebrated by more than 130 cities around the world including Toronto, United States; Melbourne, Australia; Santiago, Chile; Bogota, Colombia; Lima, Peru; Sao Paulo, Brasil and much more. Nuit Blanche or La Noche en Blanco in Spanish was first time celebrated in Spain in the capital Madrid in 2006. It had such a big success that the festival in Madrid is now taking place almost every year and offers around 200 different activities, and gives exposure to more than 150 individuals and entities. Since then different Spanish cities started hosting and celebrating La Noche en Blanco. Burgos, Bilbao, Barcelona, Sevilla, Granada, Zaragoza, and much more. The success was so huge that Noche en Blanco became an annual event in many of the cities around Spain. For example since 2008 when the first festival took place in Burgos just in 6 years it doubled the amount of events and activities during this famous night. The celebration started taking place not only in the bigger cities of Spain but also in smaller ones. For instance, In 2012 La Noche en Blanco was the first time Celebrated in Nerja, Almeria, and Caceres which were joined by Cuevas del Almanzora in 2014. Badajoz, the small province of Extremadura, celebrated the first night festival in 2011. Although this city has only 150. 000 habitats according to the organisers of the event the celebration attracted 75.000 people. The first edition of La Noche en Blanco in Malaga took place in May 2008. Now, in a couple of days, it will celebrate the 10th edition of this amazing festival. The festival grew so much in Malaga that it really superiors all the expectations. The celebration which is always taking place in Malaga one night, from Saturday to Sunday of the month of May, increased its amount of visitors by 7 times since its first edition. While in 2008 it attracted 30,000 people, in the last editions the number went over 210.000. It also significantly increased in the number of activities offered. In Malaga, the first edition of the festival counted with 36 activities in 26 different places while the last one was offering 250 and which took place in more than 100 different locations spread around the city. Most of the events take place in the plain center of Malaga city. Museums, exposition halls, art galleries, Theatres, squares and other places around the city are offering unique opportunities to be part of the art which is dedicated only for this night. Apart of free entrance to museums and expositions, you can find music, acting performances, visual arts, some special guests and much more. 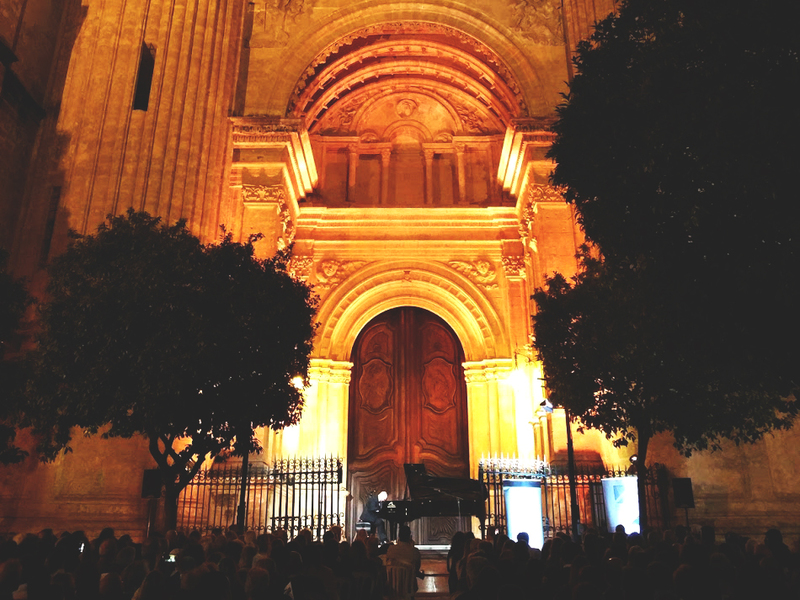 During the previous years you could count on piano performance in from of the cathedral, a free concert of one of the Spanish singers Chenoa in Plaza de la Constitucion, Karaoke auditions, live Graffiti street art and much more. This year la Noche en Blanco in Malaga will be celebrated 20th of May. We gonna be there. What about you? Join us and share your experience later on!